As you can see by the front cover we have two featured Shotokan instructors in this edition, and although from different parts of the world, their common bond is Shotokan Karate-Do, with the strong emphasis being Karate-DO! 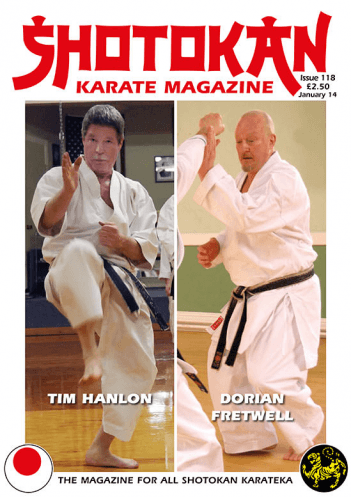 Sensei Tim Hanlon lives in Oregan, USA and Dorian Fretwell is based in London. Both are long time practitioners of the art who share a similar philosophy with regards to karate-do. What is important to me and I think to many others, is that the lesser known karateka out there all have a story to tell and ideas and insights to share. 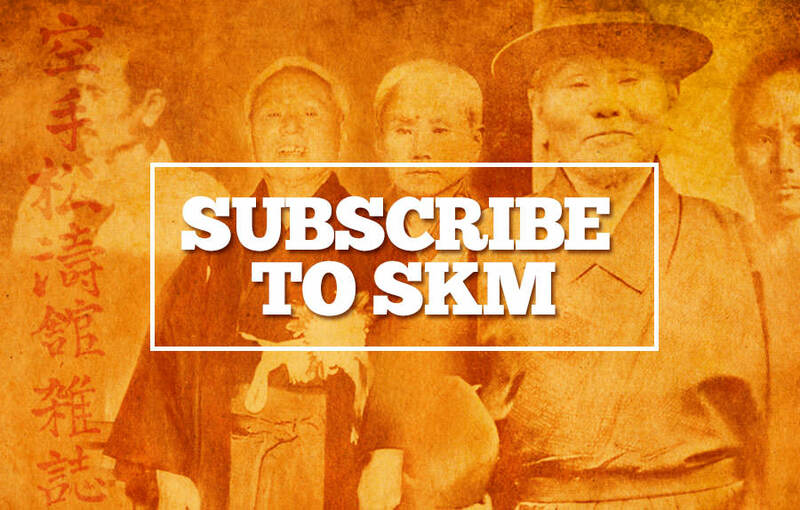 We get many letters from readers who say that they enjoy the interviews with the lesser known karateka equally as much as the interviews with world famous senseis. And on a personal note I totally agree with that sentiment. I think some of the best interviews we have had over the years have come from people who are not household names in the Shotokan world. Someone said to me recently how great it is to be a Shotokan karateka because wherever you go in the world be it as far afield as Australia or Iceland, you can guarantee that you will find a Shotokan dojo/club and regardless of any language barriers you will be able to train there and understand exactly what is going on. There are hardly any ‘massive’ differences in Shotokan in terms of techniques, kata and Japanese terminology used for techniques. I’ve been fortunate enough to train in many different countries and I have never come across any huge problems. In fact, I’d say that the slight different interpretations in kata for instance was minimal and I always stick to doing kata the way I’ve always done it. Although I’d adapt a different way sometimes, simply just for a change. We often read articles relating to the techniques and philosophy of the martial arts but rarely anything regarding the psychology involved, which in reality is probably most important of all. Peter Consterdine’s article brilliantly blends the psychological, technical and tactical aspects very clearly. Peter comes from a Traditional karate backgound and still has strong ties to karate. He is highly respected in the Martial Arts community, especially here in the U.K. Although not from Shotokan, he was for many years a stalwart of the Shukokai style under the innovative (late) Kimura sensei. From traditional competition he ventured into Full-Contact and was very successful in both types of fighting. He is also one of the fittest people (over 60) that I have ever seen anywhere in any sport or art. In my article in the last issue, ‘Wear & Tear’, I stated that I believe that we should modify our training when we are older, to have a less ‘hard’ approach. However, many people swear by continuing training (hard) in the same way. Peter Consterdine is most definitely in this latter category! I have purposely used this article in SKM, because we karateka have to realise that life in the dojo is safe, barring accidents, and completely alien from life on the street, especially regarding the psychology and tactics involved. Author: Sensei Peter Consterdine 9th Dan. I remain impressed by articles that bring home the gulf between how we train on a regular basis within martial arts, what we train for and how events unfold in real life, where we may need to resort to our combative skills. More often than not these articles are written by people who have actual personal combative experience, but who are also practicing martial artists, and have come to realise that many of the things we are taught and teach need the mirror of reality held up to them. I have instructed for over 14 U.K police forces, including the M.O.D Police, Police Service of Northern Ireland, H.M Prison Service and had a Home Office contract some years back to deliver training to what was then National Police Training on matters of personal security and defensive tactics and my sole purpose had been to endeavour to inject some sense of reality into the existing training programmes, teach impact development, pre-emption and close quarter tactics. Nowhere is the passing on of martial skills more difficult than to police officers, whose time allocation to refreshing unarmed and armed skills is probably less in a year than most committed martial artists put into training in a fortnight. The tendency is still, however, to try and teach what I believe are ‘high level’ skills which incline towards fine and complex motor skills, combinations of techniques, together with emphasis on combative stances and movement which one would normally associate with what we term ‘fighting skills’. Problems arise because many of the situations officers find themselves in rarely allow them to adopt even an appropriate fighting stance, never mind engage in a complex exchange of blocks and counters, yet this is the basis of how they practise. They are normally standing in what I term a ‘social stance,’ possibly slightly side-on to the other person, but upright and with the feet close together, as we would all stand if having a conversation with someone. From this position, getting into a ‘fighting stance’ simply doesn’t happen and simply gives the game away if any big adjustment is made to the position one is in. More critically though to police training has been the introduction of a range of weapons and associated kit such as side handled batons, telescopic batons, improved straight batons, rigid handcuffs, incapacitant spray and a range of body armour. All seemingly of great value to officer safety by providing with the impactive weapons a ‘force multiplier’, whereas in practice probably of less value than many would care to admit. Let me try and explain. One of the concepts I try and get over in police training is the psychological condition known as ‘Risk Compensation’. This condition is applicable to every human being and broadly it states that we are all prepared to take on more risk in exchange for a ‘perceived’ gain in safety. Often it is only a perceived risk and the formula works against us. I was involved, as an offender, in a scientific study of one aspect of police training which involved some 20 plus police officers taking part in scenarios where the aggression and violence increased, culminating in them being taken by surprise at close quarters. In every single case and where the assailant was at touching range, every officer attempted to draw their telescopic baton. About half a dozen had it taken off them, about the same amount had it jammed in the holster and most of the rest couldn’t bring it into play at what had become almost instantly grappling range. More critically when the baton couldn’t be used all confidence in being able to physically handle the assault went out of the window. All had been convinced through their training that the baton would be an asset in their personal safety and a false sense of confidence had, as a consequence, been invested in it. As civilians we can draw a number of important lessons from such experiences and training deficiencies, not just related to weapons, and the point I am coming to is the broad issue of inappropriate techniques for the circumstances we may encounter. The classic example of risk compensation at work is seat belt legislation. Following the compulsory wearing of seat belts there was a noticeable drop in the serious nature of injuries sustained in car crashes. What didn’t change was the number of accidents which, over a short period, actually rose. What was at work was risk compensation. People had believed the propaganda about the ‘safety’ of seat belts, which was not untrue, but the exchange they made, having taken on board the increased, perceived safety of wearing a seat belt, was to drive faster and less carefully. There are many other examples of risk, but coming back to police officers and weapons, it has had a major impact and a negative one I believe on matters of officer safety where the perception gained by most officers is that they are now safer and more competent with this range of kit than they would be without it. In too many cases it is just not true. Peter Consterdine practices different forms of martial arts including Wing Chun. For many of us as martial artists we have often bought into the myth of martial arts as an answer for all situations. If I can stay with the police analogy, one very clear problem with how police training was delivered, was its focus on what can be called the classic ‘angry man.’ In other words that an officer would be dealing with someone who was non-compliant and becoming increasingly aroused, possibly building up to becoming violent. So training focused on conflict management models of communication and a stepladder like progression of options that an officer could adopt from a ‘force continuum’ model to match the potential aggression of the offender. However, when one steps back from that scenario, there are actually some five, very specific situations in which an officer could face violence and be attacked, but no distinction had been made in training delivery in respect of what techniques and tactics would and would not work in each of these circumstances. The previous scenario and how officers were taught to handle it was predicated on what are termed ‘warning signs’ and ‘danger signs,’ these being a range of both verbal and non-verbal signals that an officer could identify, all indicating this increasing state of arousal, so anticipating the point at which the offender might attack. Unfortunately, there are people who can explode into violence with no indication of these indicators and those who are well aware of the signals they may give off and therefore suppress them, so as to take people by surprise when they attack. Martial arts training brings with it the same issues – we do not match scenarios with specific techniques, even simplistically ensuring that should we match techniques to distance, referred to as the concept of ‘ranges and tools.’ So what’s the One Yard Rule? Before getting into an explanation we need to face one very hard truth for Karateka – blocking doesn’t work in the street! If someone is within touching distance of you there is only one truism – Action Beats Reaction. Try touching at speed (vary body and head), with no telegraph against someone prepared for it and the blocks will be too late, but when you’re engaged in conversation with someone and under stress and when taken by surprise, unconsciousness will be the first consequence not a block and counter. Move out of touching range and now the whole situation changes as the person cannot hit you without moving the whole body, which is much slower and has telegraphed movement. The problem you have to come to terms with, though, is that someone who is facing you down, angry and getting angrier and on the verge of violence won’t do it from five feet away – they close in. That’s why we have coined the term about somebody being “in your face.” They will move into your space, something that simply can’t be allowed and moving back to create space won’t work as they simply fill the gap. Impact training plays a major role in Peter’s teaching. Many years ago the more specialist military units found to their cost the same problem with close range firearms encounters (and when carrying a concealed handgun) when trying to deal with an armed opponent. If the opponent had the edge in drawing their weapon, it soon became apparent that trying to beat them to the draw would likely end in disaster. It brought about the principle known as the one yard rule, which in essence says that if someone is beating you to the draw at such close range your first port of call so to speak should not be to attempt to beat them to the draw by going for your own weapon, but by applying empty hand skills and impacting hard – sometimes known as ‘punch to by time’. This is a very basic, well established close quarter combat (CQC) training concept, still practiced in U.K. specialist military circles, but it had escaped the notice of police training, and deceives martial artists into believing they have the tools for all occasions, whereas the opposite is true. Very simply, if you let someone close enough to you that they are within touching distance, then you’ve put yourself in the danger zone. We can see example of this on TV where police officers confront potential offenders with their arms by their sides, rather than, as we say, ‘talking with them,’ having them creating a barrier and a defined perimeter, or fence-line passed which nobody should intrude. Going into the technique of that we’ll leave for another time as it has some specific subtleties and construction to doing it properly. The problem we all have, police and martial artists alike in violent situations is the problem of having too many techniques and too many options. You may be thinking just the opposite that the more you know the safer you will be, but let me assure you it is simply not the case. This is the classic ‘egg timer’ syndrome. Picture the old fashioned egg timer filled with thousands of grains of sand. If, as you turned it over to start timing, all the grains of sand rushed to get through the narrow neck into the other half of the timer you would have the classic ‘log jam’. Many years ago when I started working the doors in Manchester (over 10 years) and in my first few months that’s in fact what happened to me – I simply knew too many techniques, too many combinations and too many potential responses, at a time in a confrontation when all I needed was one, very simple but very impactive technique when faced with a violent man on the verge of attacking. I was leaving things too late in the ‘hunt’ for a suitable technique answer to the problem and mistaking some competence in fighting skills with defensive tactics. Eventually I substituted decision making for ‘action triggers’ (an article in itself), based on Pavlovian, or primary conditioning, linked with an absolute conviction about pre-emptive action. The psychology and tactics of fighting and not just the techniques are always analysed. We know too much for it to be of actual use and when stress hits us we also know from numerous psychological studies that the first faculty we lose is the ability to make decisions. So the longer we allow an aggressive confrontation to develop the less ability we have to decide to act and with too many choices the problem is magnified. Like police officers with their weapons we have taken refuge in the belief that the more complex the Eastern martial art we practise the safer we will be, but let me remind you where we started with this and that’s ‘risk compensation’. Don’t rush in where angels fear to tread in the mistaken belief that your vast array of techniques and skills will be to your advantage. Our perceived safety in knowing a great deal may lead us to believe, and falsely, that we can take on all comers, in all circumstances. The truth is that we will be successful in direct relation to what we discard not what we know. In later articles I want to look at the concepts of personal combat, in particular the psychological, physiological and stress responses that come into play without our conscious involvement. If we do not have the knowledge and skills to enable us to make allowance for these fundamental issues we will seldom make the successful leap from the relative safety of the Dojo to the, often, unsafe reality of the street.